Firefighters respond to emergency situations and primarily protect people, the environment and property from all types of accidents and emergencies. They control and extinguish fires, working together as members of fire brigades. Firefighters work closely with the local community to increase their level of fire safety awareness in order to help prevent fires and accidents occurring in the first place. undertake public education tasks including school visits, demonstrations, first aid, firefighting training and lectures. Why did you become a firefighter? I’m an outdoor-loving person involved in climbing and mountaineering, so I was looking for something that would suit my interests and not confine me. I always enjoyed helping others and wanted to become involved in the rescue scene. What training did you undergo? When I joined in 1984, the induction course was an intense, physically demanding one that lasted three months. 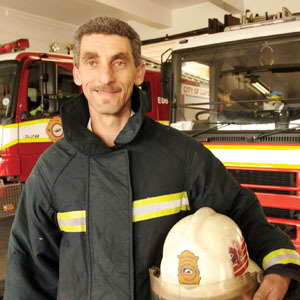 I did many internal courses, such as: extra heavy vehicle driver, rescue and extrication; advanced breathing apparatus; and advanced firefighting. I obtained my National Diploma in Fire Service Technology at Cape Technikon from 1987 to 1989, and obtained an Intermediate Life Support paramedic qualification in 1988. Training is ongoing. What type of personality is suited to this job? Someone who can work well with others, displays empathy, enjoys helping others, and is physically and mentally strong. Describe a typical day at work The fire service is divided up into fire suppression, fire safety, training, and dispatch and control sections. A typical day on the job will differ between sections. I am a senior manager in the suppression section and my day differs largely from that of a firefighter on shift responding to emergency calls. For them, the day begins at 9am and ends 24 hours later. They do daily fire/rescue drills and lectures, check/test and maintain equipment, respond to all emergency call-outs, and clean and maintain the station premises. They are only allowed to leave the station precincts on call-outs or fire service-related business during the shift. The time of year impacts greatly on the daily routine and the type and number of calls received. Are there aspects you enjoy most? The fact that the fire/rescue environment is such a diverse one and that you are forever learning. Ongoing changes in technology continually affect the service in all spheres. Anything you’re not too keen on? The administration part that goes hand in hand with a management position. What are your future career goals? This is my career and I’m here to stay. Department Head, watch out! What advice would you give someone starting out? This is a rewarding career in many ways. From the outset, apply yourself and take full advantage of the courses and other avenues open for advancement. A degree or formal further education qualifications are not essential to becoming a firefighter. Personal qualities and physical attributes are more important than academic qualifications, though a good general education is required. There are a few vocationally-focused courses available that do not guarantee entry into the fire and rescue service, but aim to equip students with the skills needed to pursue a career in the fire industry. It is necessary to complete a period of in-service training, which involves trainee firefighters receiving both practical and theoretical training in various aspects of firefighting and paramedics. Graduate firefighters can further qualify by passing the exams of the South African Emergency Services Institute.